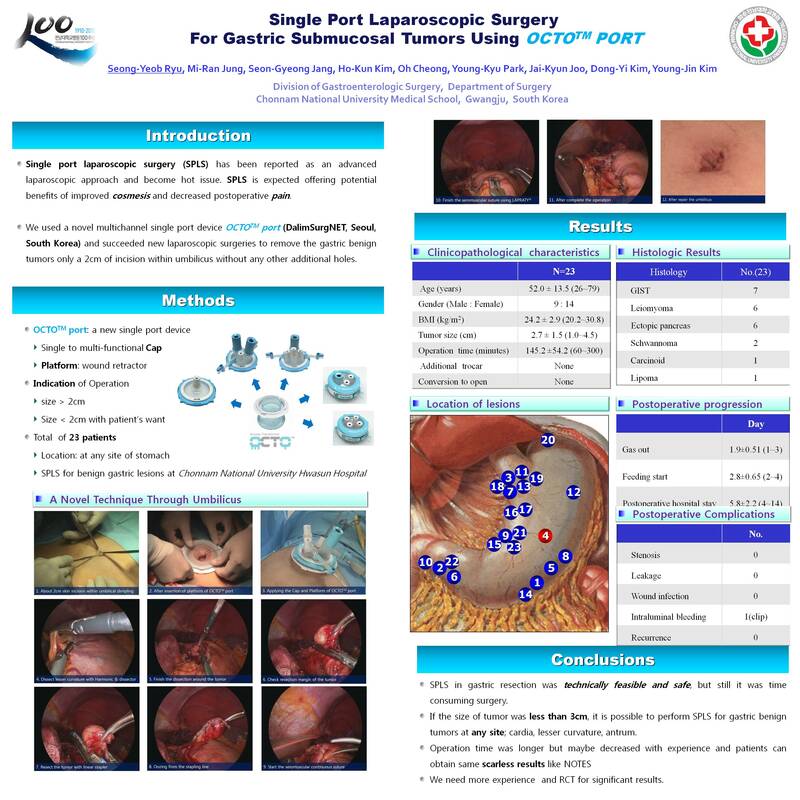 Introduction: Single port laparoscopic surgery (SPLS) has been reported as an advanced laparoscopic approach and become hot issue. SPLS is expected offering potential benefits of improved cosmesis and decreased postoperative pain. There are few reports about SPLS for gastric tumors. We used a novel multichannel single port device (OCTOTM, dalimSurgNET, Seoul, South Korea) and succeeded 23 cases of new laparoscopic surgeries to remove the gastric benign tumors only a 2cm of incision within umbilicus without any other additional holes. We would like to discuss about the feasibility of this new laparoscopic surgical technique and usefulness of new device. Methods and procedures: The OCTOTM port consists of platform and multichannel cap. The platform consists of one internal ring and cylindrical silastic sleeve. The cap incorporates three or four channels for laparoscopic instruments. The cap can be easily attached or removed from the platform during specimen extraction. First, wound retractor of platform was inserted through small umbilical incision and covered with the cap for pneumoperitoneum. Using this port and special instrument, deflectable at the shaft, we performed gastric wedge resections and enucleations. Results: 23 patients with benign gastric tumor underwent gastric resection, 9 males and 14 females; mean age, 52.0 (range, 26-79) years. Mean body mass index was 24.2 (range, 20.2-30.8) kg/m2. No patients required additional skin incisions or trocars. Mean operation time was 145.2 (60-300) minutes, and blood losses were minimal in all cases. The tumors located evenly in stomach; upper, middle, lower 1/3, 10, 9, 4, respectively. The tumor size ranged from 1.0 to 4.5 (mean 2.4) cm and pathologic result showed 7 GIST, 6 leiomyoma, 6 ectopic pancreas. Conclusions: SPLS in gastric resection was technically feasible and safe, but still it was time consuming surgery. If the size of tumor was less than 3cm, it is possible to perform SPLS for gastric benign tumors at any site; cardia, lesser curvature, antrum. Operation time was longer but maybe decreased with experience and patients can obtain same scarless results like NOTES. We need more experience for significant results.